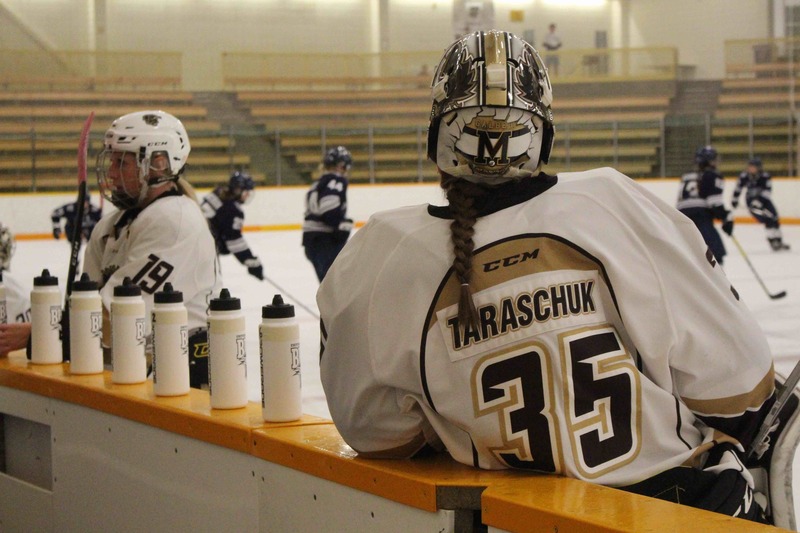 For the second consecutive season, the University of Manitoba Bisons women’s hockey team advanced to the Canada West conference championship, this time upsetting the 10th-ranked Alberta Pandas in three games this past weekend. The opening game went perfectly for Bisons goalie Amanda Schubert. Fresh off a 66-save quintuple overtime win in game three of the CanWest quarterfinals, the fourth-year goalie earned a 25-save shutout in game one of the semis in Alberta – a 3-0 triumph for the away team. The opening frame ended 0-0 with a limited number of pucks sent to either crease. Alberta led the shot clock 4-2 after 20 minutes. In the second period, the shots picked up for both teams. Alberta’s powerplay unit saw action twice in the frame, but couldn’t beat Schubert who made four saves on two penalty kills. Lindsey Post in the Alberta goal also kept the Bisons quiet. Seven minutes into the third period, the Bisons broke through. Erin Kucheravy set up Alexandra Anderson, who fired a rocket past Post’s shoulder from the point. Having suffered three shutout losses to the Pandas this season, the Bisons were eager to make the best of the third period after finally beating Post. At 13:20, Venla Hovi was stopped by Post on the rush, but Lauryn Keen scored on the doorstep to double the Bisons’ lead. The goal marked Keen’s seventh point in four playoff games. Unassisted, Cassandra Taylor scored an empty-net goal to finish the game off. Schubert’s shutout marks her third of the entire season, improving her stats to 1.74 goals against average and 0.943 save percentage. 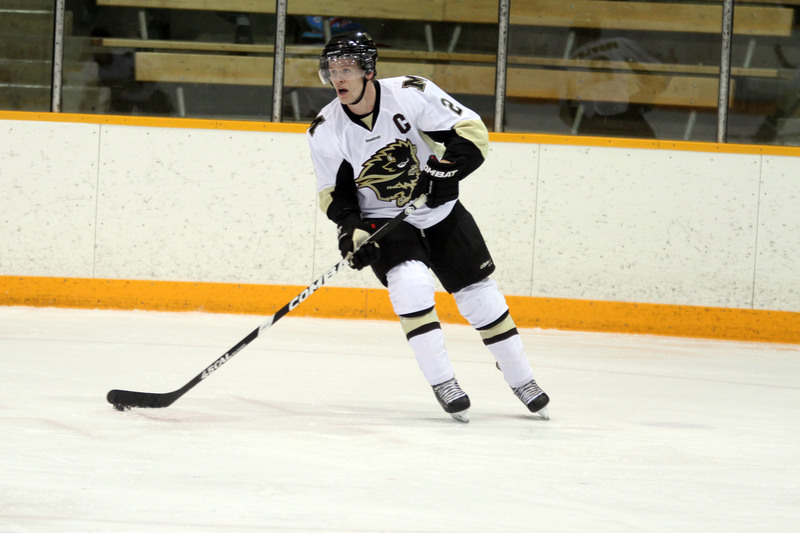 A decisive third period saw the Pandas clinch victory in game two on Saturday. Alberta scored the eventual winner one minute after the Bisons had levelled the game in the third frame to win 2-1. Three minutes into the first period, Cayle Dillon picked out Hannah Olenyk, who beat Amanda Schubert blocker side to open the scoring. Alanna Sharmanin alone against Post in the second period, but couldn’t apply the finishing touch as the puck went wide of the target. The winger later made amends at the start of the third period when she walked in on another breakaway and beat Post’s glove for the equalizer. Manitoba only stayed level for just over a minute. The Pandas’ response was prompt when Ashley Morin fired from her knees in the slot to regain the lead for the hosts. Morin’s goal would decide the game as Alberta hung on to win 2-1. Post played a pivotal role for the Pandas, making 25 saves while Schubert stopped 17 of 19 shots. In yet another game-three overtime performance, the Bisons were triumphant over the Pandas. Defenceman Alexandra Anderson clinched a 4-3 win in the first overtime for the herd, who now move onto the Canada West conference finals. Manitoba took a 2-1 lead into the first intermission after the Pandas drew first blood. Megan Eady scored her first of the post-season to give Alberta a 1-0 lead six minutes into the game. The visitors tied the game at one through Kayleigh Wiens with Courtlyn Oswald and Charity Price drawing the assists. The Bisons then took the lead with less than five minutes remaining in the first period, as Karissa Kirkup scored unassisted to earn her first point of the playoffs. Six minutes into the second period, Alberta got themselves level. Dillon beat goalie Amanda Schubert for her second point in as many games. Manitoba was determined to retake the lead, though, and did so when Hovi scored her league-leading fourth goal of the playoffs midway through the second. As the clock ticked down, Sasha Lutz made herself an instant hero for Alberta. She scored the equalizer with 14 seconds remaining and briefly saved the Pandas’ season as the game went into overtime. However, in the extra frame it was Anderson who rose as the hero. Her second goal of the series clinched a 4-3 overtime victory for the Bisons, sending Manitoba into the Canada West finals.